This series is designed to guide students step by step through the process of learning to blog. The activities can be completed at your own pace and in any order. Help you understand how pages are used on blogs. Set up an About page on your blog. Pages are best suited for information you rarely update such as your About and Commenting Guidelines page. Information you want to share with others, such as your interests or what you learnt in class, or questions you want to ask readers are normally published as posts and not on a page. 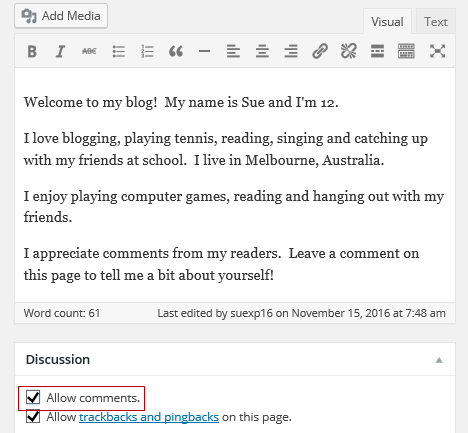 Posts are automatically fed into the Reader in your dashboard where other students from your class can easily read and comment on your posts (if your blog is connected to a class blog via My Class). Pages don’t appear in the Reader and are only viewed when someone visits your blog. Watch this video to learn more about the difference between posts and pages. One of the first things a new visitor to your blog looks for is your ‘About’ page. 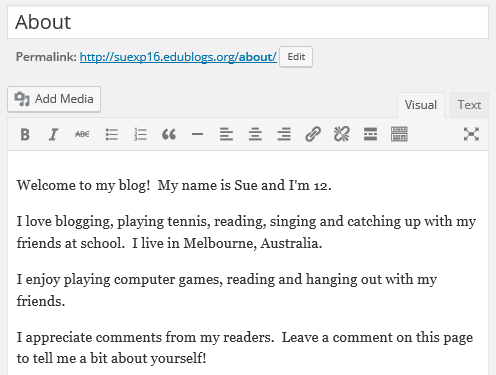 Your ‘About’ page tells readers more about the person who is writing the blog posts. An ‘About’ page is like meeting someone for the first time — it is the way a blogger introduces themselves to their readers. Does the person have similar interest to me? Write a post about yourself. Write an A-Z About page such as I am an athletic, yet brainy child who decided that saving the environment is one of my future goals. Create a list of things that people may not know about you. All newly created blogs come with a ‘Sample page‘ created. All you need to do is edit the ‘Sample page’ to change it into your About page. 5. Edit the permalink to change it to about. It should now look like this! 6. Add your about information and when finished click Update. Remember to be Internet safe. Don’t include any birth dates, phone numbers, any personal information like your last name, your street address or your school name. Tell your readers about your interests without providing any personal or identifying information. 1. Click on Screen Options 2. Select Discussion and then click on Screen options to close. 3. Scroll down to the Discussion module below your page editor and select Allow Comments. 4. Click Update. The area where you write your pages and posts is by default in Visual Editing mode which uses WYSIWYG (What You See Is What You Get) option for formatting. It works similar to any Word processing software. Simply write your post, highlight any text you want to format, and then click the appropriate button in the toolbar to add formatting such as bold, italics, or a numbered list. The Toolbar Toggle icon is used to view the advanced formatting options in the second row including heading styles, underlining, font color, custom characters, undo, redo. You switch between Visual Editing mode and HTML editing mode by clicking on the Visual or Text tab. Publish an About page. Creative ideas for your About page include: 1) Write a page about yourself; 2) Write an A-Z About page such as I am an athletic, yet brainy child who decided that saving the environment is one of my future goals; 3) Create a list of things that people may not know about you. It can be descriptive like Penelope’s About Me or creative like Brianna’s Alphabet post and Karah’s About Me: About My Country. Leave a comment on this post and tell us how you went writing your about page. Remember to leave a link to your about page in your comment so we can have a look at your new About page. This is a self paced series for students. Refer to our other courses if you are a teacher. This was easy to write all i had to do was think of myself and write it out. Hi Jack, great work with your page! Just remember when sharing your URL to not sure the part at the end that says /wp-admin etc. This leads to your dashboard. (I updated your comment with the correct link). I thing writing the post was interesting because I learned how to do something I didn’t know how to do before. Thanks for sharing some interesting information on your About page. Happy blogging! To write my “About me” page was very difficult because I know what I like but its hard to think of it when your forced to. I know that sounds a little weird but that’s because I am weird. Over all this was a very fun page to write! What a creative page. Well done! Hi Sean, what a great example of an about page! This might give ideas to other new bloggers. Making an about page was, in a way, hard. I had to reflect on how I act, like what are some certain characteristics that I have? Or what makes me weird? Or what are some things people don’t know about me? But it was useful because other about pages inspired me and helped me. I had fun making my about page. It explained how a am and what I enjoy doing. Gave me time to think about myself and who I am as a person. And i’m not the most exiting person but if you do read it by any chance you will get to know who I am. This site is helping me learn about blogging and I believe it was easy to make my about page but I also wanted to make it good. Writing my about page was very smooth. I really like the styles that the page offers. Writing my page was easy, compare to writing my post. I gave my reader info about my future on what I want be when I grow up! This challenge helped me a lot on what to do when I created my about page and it was really helpful that it tells you what to do on each step. Thank for the boot camp, I was able to change my about page and I will later add comments so people can see my about page. This site helped me out a lot in learning more about blogging and creating my about page. I learned how to create a page and the purpose of a page. Thanks. This was very helpful in learning how to and why to set up and about page. The importance of one, which was helpful in doing so. Also it is very clear that we are not supposed to publish any information that would give up our identity in any way, this made this even more clear. My About Page basically how I have zero tolerance for certain types of people on my BlogPost. I also made sure to ooze quite a lot of my personality into the About Page so I’m sure readers will be pleased.